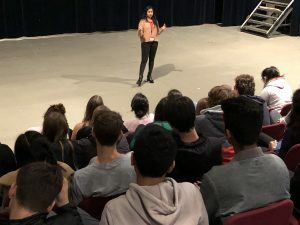 Shveni Shah, Class of 2014, returned to AIS to share her experience applying to and studying at a US university, as well as life at a university in the US. She also explained how strategies acquired in the IBDP served her as a university student. It was an interactive session with useful first-hand information. It was good to hear about university applications from an alum of AIS because the information felt applicable to us and gave us an idea about the process that we will undertake at the end of this year. It was interesting to hear about the possibility of creating our own majors at a US university, specifically tailored to our own paths, and it was very helpful to hear about the process of applying to universities, and what we should research in advance. For example, the fact that we should also research what extra-curricular activities the university offers and not just our course options, to strike a balance between our studies and our social life. The IB Diploma can be a daunting experience. On top of that, university applications provide an even more challenging prospect. The last two years of school are not easy and often present many unexpected challenges. Therefore, having an alumna come speak to us all was very reassuring. As a student in Grade 12, half of my IB Diploma has been completed; I am more focused on university. It felt encouraging to meet someone who had gone through the exact same experience we are going through, as it showed the positive end result achievable in the near-future. Through this talk, I received specific insight regarding university applications but also what it is like to transition from secondary school to university. The big changes that await us were highlighted; these included: being away from home, becoming more independent, and balancing your studies with personal interests and part-time jobs. Overall, the Alumni Talk gave us a closer look at what is to come, providing the IB Diploma students with tips but also served as a reminder: no matter what happens follow your passion and make the best of the situation you find yourself in.